Fresh tortilla chips with beans, melted cheese, guacamole, sour cream, jalapeño peppers, and tomatoes. Especiales with chorizo, beef, or chicken add $2. With steak or shredded beef add $3. Fresh avocado dip. served with tortilla chips. Soft corn or flour tortillas with melted cheese guacamole, sour cream and jalapeño peppers. Especiales with chorizo, beef, chicken, or spinach add $2. With steak or shredded beef add $3. Three pork tamales with ranchero salsa or chile con carne and melted cheese. Variety of our appetizers. Serves 4-5 people. Chicken and Rice (Mexican Style) made to order. Lettuce, tomato, bell peppers, onions, sour cream, avocado, black olives and cheese in crispy flour tortilla shell and covered with our chile con carne. Substitute chili con carne with chicken or beef add $1 steak add $2. Fresh tossed salad with avocado slices, tomato, onions and bell peppers. Fresh tossed salad, choice of dressing. Chicken salad with sliced avocado. Tuna fish salad with sliced avocado. Includes rice and beans on the side; Any combination of fillings 50¢ extra. Corn tortillas filled with your choice of beef, chicken, pork, or avocado, topped with chopped lettuce, cheese and tomatoes. Same as above with soft flour tortillas and sour cream. Marinated grilled pork topped with cilantro, onion and lime. Served with your choice of corn or flour tortilla. Our succulent skirt steak grilled to perfection, topped with lettuce, onion, cilantro, tomato and avocado. Choice of corn or flour tortilla. Tortilla and lime crusted Tilapia topped with cilantro, onion, tomato and lime. Served with your choice of corn or flour tortilla. Topped with cilantro, onion and tomato. Served with a side of spicy mango salsa. Topped with cilantro, onion and tomato. Served with your choice of corn or flour tortilla. Includes rice and beans on the side: Any combination of fillings 50¢ extra. With Steak or Shredded Beef add $2. Three corn tortillas with your choice of fillings and salsa. Topped with cheese. Fillings (Choose 2): Chicken, Beef, Pork, Spinach, Cheese, Vegetarian beans. Salsa (Choose 1): Roja (Guajillo), Verde (Tomatillo), Molé, Chili Con Carne, Ranchera, Suiza (Campana salsa & sour cream). Three corn tortillas with your choice of fillings and salsa. Topped with cheese. Fillings (Choose 2): Steak, Shredded Beef, Chicken, Beef, Pork, Spinach, Cheese. Salsa (Choose 1): Roja (Guajillo), Verde (Tomatillo), Molé, Chile Con Carne, Ranchera, Suiza (Campana salsa & sour cream). Three corn tortillas filled with seasoned shrimp and covered with our Campana suiza salsa and cheese. With Steak or Shredded Beef add $2. With Shrimp $3. Extra large flour tortilla filled with beef, chicken or pork, then grilled & topped with ranchero salsa and melted cheese. Also available with Chile con carne salsa or salsa verde. Flour tortillas with a light spread of beans filled with slow cooked seasoned pork, topped with cheese and ranchero salsa. Same as above with fresh tomatillo salsa. Flour tortillas with a light spread of beans filled with chorizo (Mexican sausage), topped with cheese and ranchero salsa. Skirt steak and light refried beans wrapped in extra large flour tortilla and grilled. Served with rice, guacamole and sour cream. Seasoned grilled tomatoes, onions and peppers in a large flour tortilla. Topped with cheese and ranchero salsa. Served with rice and beans. Extra large flour tortilla filled with beans, lettuce, tomato and cheese then grilled. With rice and beans add $3. Beef, Chicken or Pork $7. Steak, Shredded Beef or Al Pastor $8. Includes rice and beans, pico de gallo, sour cream and your choice of corn or flour tortilla. Sliced skirt steak grilled with onions, tomatoes, green peppers and poblano peppers. Breast of chicken sliced and grilled with onions, tomatoes, green peppers and poblano peppers. Shrimp grilled with onions, tomatoes, green peppers and poblano peppers. Steak and chicken grilled with onions, tomatoes, green peppers and poblano peppers. Seasoned and grilled onions, tomato, poblano peppers and green peppers. Three pork tamales covered with melted cheese and ranchero salsa or chile con carne salsa. Served with sour cream and guacamole. Called “Flutes” because of their long slender shape. A deep fried corn tortilla filled with your choice of beef or chicken. Served with sour cream & guacamole. Crisp, open face tortillas topped with beans and choice of beef, chicken or avocado. Served with lettuce, tomato, cheese and sour cream. Hand made corn massa bowl deep fried, filled with beans and your choice of beef, chicken, pork or chorizo. Topped with lettuce, tomato, cheese and sour cream. All combination plates served with rice, beans, guacamole, sour cream and jalapeno peppers. With substitution with steak add $1 per item. One chicken enchilada, one crispy beef taco, one beef chile relleno and bistek a la Mexicana. One chicken flauta, one beef enchilada, bistek a la Mexicana and one crispy beef taco. One crispy beef taco, one beef chile relleno and one pork tamale. One pork burrito, one chicken enchilada and one Texas style beef taco. One beef tostada, one cheese enchilada and one crispy chicken taco. One beef flauta, one chicken tostada and one pork burrito. Includes salad with your choice of dressing, substitute a bowl of soup for salad add $2. Corn or flour tortillas by request. Skirt steak grilled to your order. Served with rice, beans, guacamole and Mexican papas. The same exquisite steak as above with a cheese enchilada on the side, and fried poblano peppers. Served with rice, beans, and guacamole. Grilled succulent ribeye steak with Campana’s Ranchero salsa. Served with rice, beans and guacamole. Ribeye steak seasoned and breaded, pounded very thin and served with rice, beans, guacamole and Mexican papas. Mexican pepper steak seasoned with bell peppers, tomatoes, onions in our special salsa, mild or hot. Served with rice, beans, and guacamole. Two marinated beef skewers with bacon, green peppers, onions and tomatoes. Served with rice, beans and guacamole. Our succulent skirt steak and three large garlic shrimp or three breaded shrimp. Served with rice and Mexican papas. Chefs specialty. A half chicken covered in our very own “Mole” salsa & a light sprinkle of sesame seed. Served with rice and beans. Chicken sauteed with green peppers, tomato, onion and Spanish olives topped with ranchero salsa and sour cream. Grilled marinated chicken breast, served with rice, Mexican papas and guacamole. Large grilled in shell garlic shrimp served with rice, Mexican papas and garlic bread. Shrimp sauteed with green peppers, onions, Spanish olives and tomatoes in a light tomato garlic salsa. Served with rice. Grilled filet of red snapper with Spanish olives, tomato, onion, green peppers in a light garlic tomato salsa. Grilled filet of red snapper in light garlic butter and wine salsa with Mexican papas and rice. Lightly breaded pan fried cod topped with a garlic butter and wine salsa. Served with Mexican papas and rice. Lightly breaded pan fried cod fish topped with Spanish olives, tomato, onion, green peppers in a light garlic tomato salsa. All Tortas are prepared with avocado, beans, sour cream, lettuce, tomato, onion, and jalapeños. Served with french fries or mexican papas. Our juicy skirt steak diced and grilled to perfection. Avocado slices, beans, lettuce, tomatoes, onion and cheese. Mexican sausage scrambled with 2 eggs. Seasoned and grilled onion, tomato, poblano and green peppers. All eggs served with rice and beans or potatoes, garnish and tortillas. Scrambled eggs with onions, tomatoes & peppers; served mild. Fried eggs covered with ranchero salsa. Eggs cooked omelette style, covered with light tomato sauce and melted cheese. (2) Eggs cooked your way with a 5 oz. piece of our succulent skirt steak. Choice of chocolate, strawberry or honey topping. OREO cookie fried ice cream. Nutella filled mini chimichangas served with vanilla ice cream and topped with whipped cream, powdered sugar and chocolate sauce. Deep-fried pastry dough covered with honey, served with a side of strawberries and whipped cream. Mexican cookies dipped with cinnamon and sugar. Topped with choice of chocolate, strawberry or honey, whipped cream and a cherry. Fried bananas served with a vanilla cream sauce, topped with whipped cream and cinnamon. Custard filled churros with whipped cream and chocolate sauce. Mexican brick chocolate melted with hot milk and cinnamon. Topped with whipped cream and cinnamon. Lunazul Reposado, Domain De Canton, Ginger Liquor and cucumber soda with salted rim. Lunazul Añejo Tequilla, bitters, house made brown sugar simple syrup served on the rocks with orange and cherry. Cinnamon Tequila, fresh lime juice, ginger beer and mint leaf. Served in a chilled clay pot with salted rim. 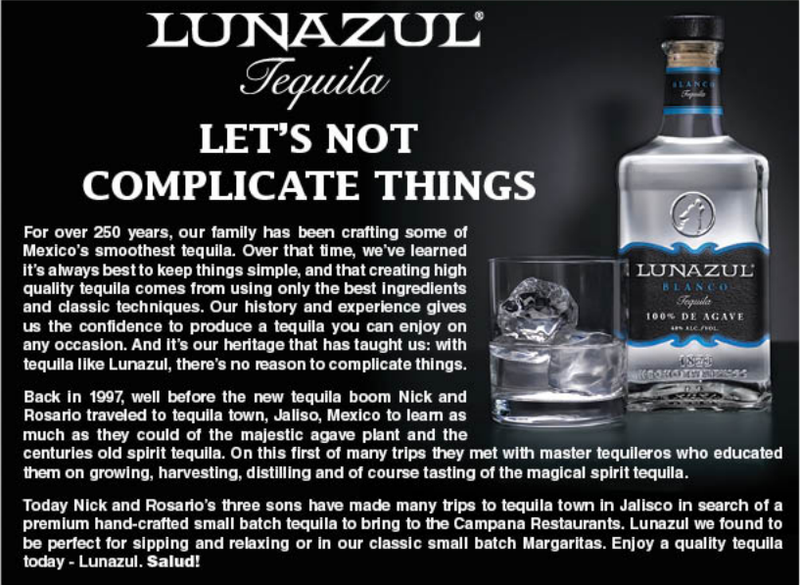 Lunazul Tequila, with fresh citrus fruits and grape fruit soda, chile, lime and salt. Served in a chilled clay pot.